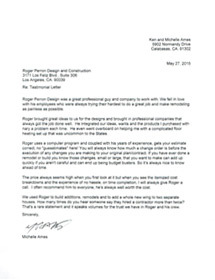 Ames » Roger Perron Inc.
Roger Perron Design was a great professional guy and company to work with. We fell in love with his employees who were always trying their hardest to do a great job and make remodeling as painless as possible. Roger brought great ideas to us for the designs and brought in professional companies that always got the job done well. He integrated our ideas, wants and the products I purchased with nary a problem each time. He even went overboard on helping me with a complicated floor heating set up that was uncommon to the States. Roger uses a computer program and coupled with his years of experience, gets your estimate correct, no “guesstimates” here! You will always know how much a change order is before the execution of any changes you are making to your original plan/contract. If you have ever done a remodel or build you know those changes, small or large, that you want to make can add up quickly if you aren’t careful and can end up being budget busters. So it’s always nice to know ahead of time. The price always seems high when you first look at it but when you see the itemized cost breakdowns and the experience of no hassle, on time completion, I will always give Roger a call. I often recommend him to everyone, he’s always well worth the cost. We used Roger to build additions, remodels and to add a whole new wing to two separate houses. How many times do you hear someone say they hired a contractor more than twice? That’s a rare statement and it speaks volumes for the trust we have in Roger and his crew.